£10,000 raised for Alive and Kicking! Many of our Alive and Kicking balls were kicked about, plenty of water was drunk, an assortment of food was eaten, and most importantly, a tonne of fun was had by all at our biggest and most successful 5-a-side tournament to date. On Friday 26 May, a variety of teams from different companies all around London gathered in Shoreditch Power League to play the great game. 21 teams competed, 59 matches were played and by the end of the day, 2 teams emerged victorious. As a result we managed to raise over £10,000 to support sustainable employment, health education, and much loved ball donations across Africa. Eight teams qualified through to the nail biting quarter final matches: Argentina FC, Frank Hirth, Freshfields, Baker & McKenzie, FBN2, APOB, Goodman Derrick and SPB. At the end of it all, only four teams remained to compete in the Alive and Kicking tournament final, for the women’s team: Slaughter and May v MMG UNTD, and for the men’s team: Argentina FC London v Freshfields. Both final matches consisted of brilliantly unexpected goals, amazing saves and triumphant team work. 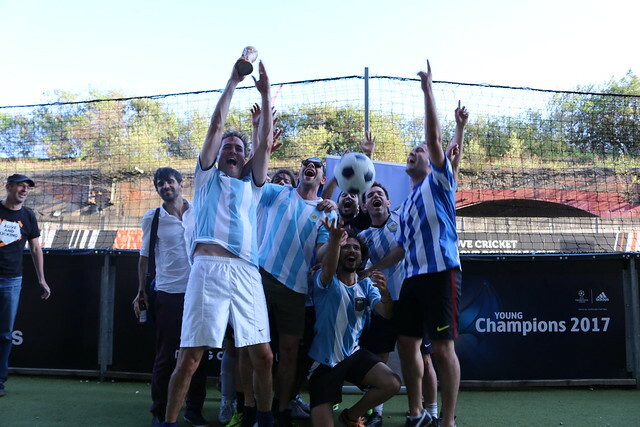 However, only one team from each match could be victorious, and so we want to say a special congratulation to the Women’s Champions: Slaughter and May, and the Men’s Champions: Argentina FC London. As a special prize for the finalists, we’ve edited together a highlight package featuring commentary from the legendary Peter Drury! We’d like to extend a special thanks to FBN BANK and the BUSINESS COUNCIL FOR AFRICA for their support in the organising and running of the event – without them it wouldn’t have been possible! We hope to see many of the teams that participated return for our 5-a-side tournament in 2018, including both of the winning teams to defend their titles. We’ve already started planning for next year’s tournament – so if you’d like to find out how you can become involved in future events, please get in touch via email at info@aliveandkicking.org.